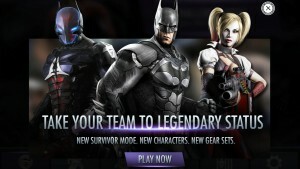 Netherrealm Studios and Warner Bros. have just released the next update for Injustice Mobile. It is version 2.7 of the game and brings a lot of changes and bug fixes. Among the other changes are holiday login bonuses which start on December 11th and will go all the way to New year’s Day. Survivor Mode has also been changed and expanded a little. The mode will now give you access to more new gear cards, including League of Assassins and new Lexcorp Gear. In addition to this, the difficulty of the mode has been corrected and now it will be more accessible and balanced. 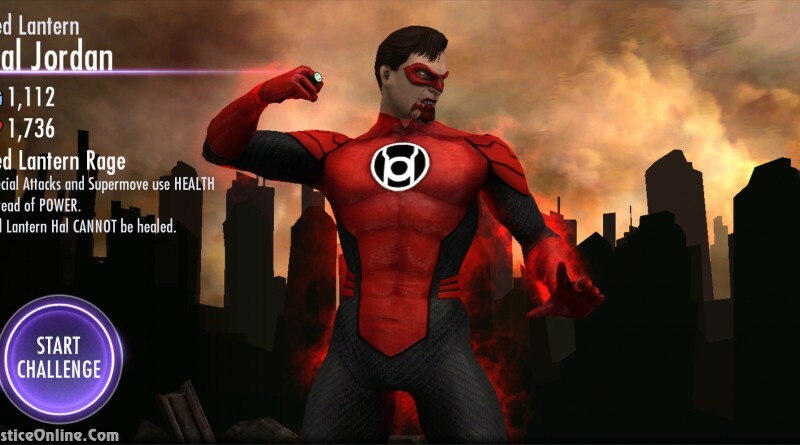 The recently released Red Lantern character has been updated as well. Special cool-down: After performing a special you will have to wait a bit for the special to load before you are able to use it again. Special 1: The damage of Special 1 has been corrected. Special 2: The insanely high damage of Special 2 has been significantly reduced and may be a bit too much reduced as it now does less damage than Special 1. We just wanted to say THANK YOU and HAPPY HOLIDAYS from the team here at NetherRealm! Starting on December 11th, running through New Year’s Day, login to Injustice daily to receive free CHARACTERS, GEAR, POWER CREDITS, and MORE! 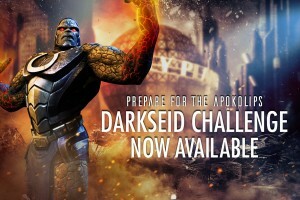 APOKOLIPS DARKSEID joins Injustice Mobile to bring his destruction to the mortals of Earth! Will you have what it takes to defeat this conqueror of worlds and add him to your collection? New GEAR SETS await you in Survivor Mode. Earn the new LEAGUE OF ASSASINS and new LEXCORP Gear and gain advantage over your enemies. Steal your opponents power, drain life and deal damage over time with LEAGUE OF ASSASSINS Gear. LEXCORP Gear will massively increase your character’s power, increase critical damage and can even absorb more damage. Combine all of the Gear in a Set and optimize your edge. What do you think of this update, let us know in the comments? ← Injustice Year 3 Part 1 Enters The New York Times Bestseller list at #3! Glad I sold my 2 extra Red Lantern Hals from the previous challenge. I had a feeling he wouldn’t stay useful. As for new Darkseid, my guess for his passive will be something along the lines of “Empower Generals: All SILVER characters on Darkseid’s team gain +200% HEALTH and DAMAGE.” Seems legit, right? Even if just +100%, that would still be a great way to make Silvers relevant in multiplayer for something more than budget defense teams. Survival mode needed a difficulty overhaul. Difficult matches are fine, but instantly jumping in one match from “Hard, but possible” to “Have Raven Prime Or You Lose” just made it boring, regardless of potential rewards. Match 10 consistently being “Fully Geared Arkham Team” or “Regime Killer Frost + Healing Suppression + Radiation” where a single SP1 can one-shot your level 50 EVII’s = shoddy development. Can’t wait to see the new Darkseid character. Would love to learn his passive ability. Darkseid Prime is in fact one of my favorite characters in the game. Darkseids ability is black racer combo finisher. I think this update only helped hackers because now i’m not even able to complete a 5 Match MP mode thanks to people having Apokalips Darkseid with 3 4th world helmets and teams with full league of assasins and lexcorp gear. where is the ban Hammer when you need it? you need to figure out how to let us report teams directly from the app. I don’t think anyone can beat these cheaters at this moment specially when you underpowered SP2 on HJRL. please help the loyal players in the community take back their rightful place in the leaderboard. when is this update going to be available in android? The update is already available. If you get the Christmas gifts when you log in, then you have it. If not, go to the play store and update. It’s getting so ridiculous I don’t want to play. Gear cards are fun but not only are good ones impossible to get, but these hackers seem to have them of course (fully loaded). It’s getting so ridiculous now. Instead of making the game harder, why not try newer characters like Mr Freeze, riddler, etc…it was cool a few months back but now it’s too chaotic. At least make the gear packs attainable or challenges that you can win all three. (League of assassins, lexvorp, other world) not a gauntlet or a cloak. Boring! Netherrealm Studios did add a lot of things lately. They probably need a little while to get a grip on things again. when will the lexcorp gears be released in android? Do you mean the new or the old Darkseid? The old one was twice in a single player challenge. If you don’t have him, the only way is to use booster packs. The new one has not been in a challenge yet. Should come soon though. is the L.O.A. gear already available in android? only got the lexcorp set. thanks. Same thing here. Don’t really know, we will have to wait and see. Lexcorp in kind of unfair. I used it with batman n i cud easily kill arkham knight batman…. So when u get complete lexcorp set then u can kill opponent twice as powerfull…. So i find it unfair…. What r ur top 5 fav characters in justice. Honerable mentions: John Stewart Green Lantern, Lobo (prime, havnt tried Bounty Hunter version), Krypto Lex Luthor, Batman Prime, Raven Prime, Black Adam (gold, don’t know what it’s called, Wonder Woman Regime, etc. They should put new challenge characters in their next update like larfleeze,CW’s zoom,and they should put ares on offline challenge mode. I personally think having Cassandra Cain (Batgirl) and Ares ONLY in online seasons is rather fun. Most characters arn’t like that, it’s only those two (that I know of), and it isn’t even that hard to get in the top 5%. 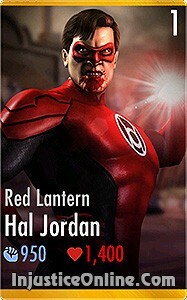 Imma just say, Red Lantern Hal Jordan looks okay, not great but not horrible.